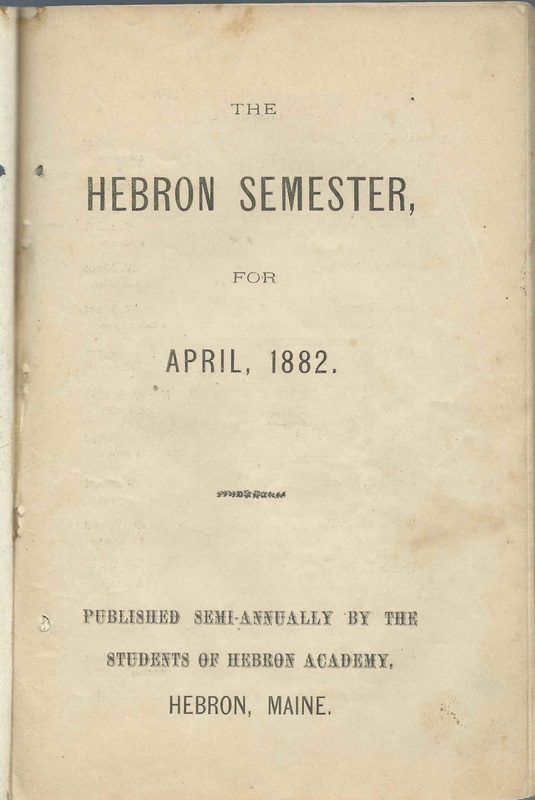 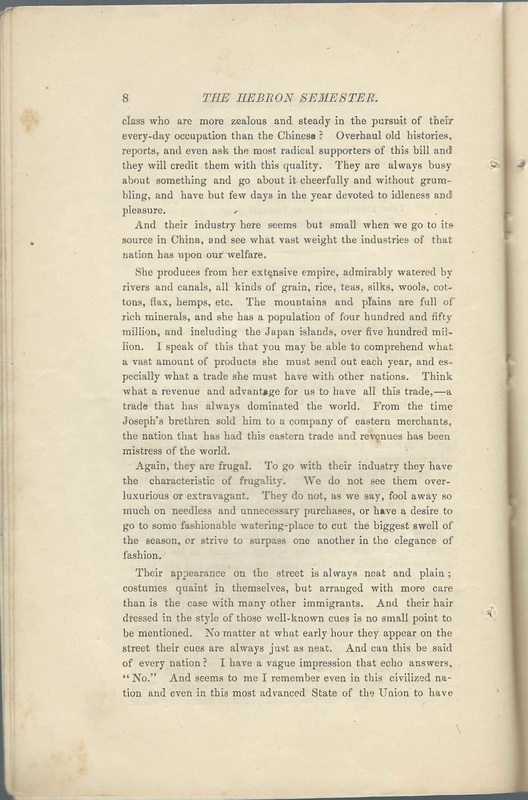 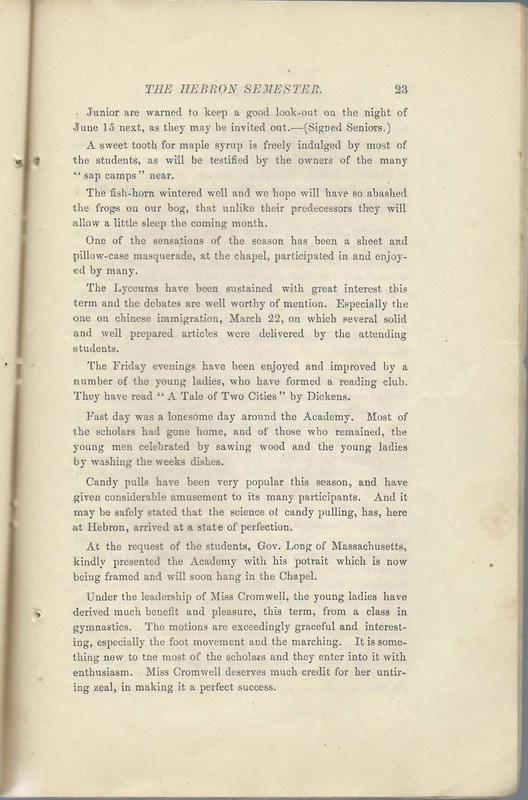 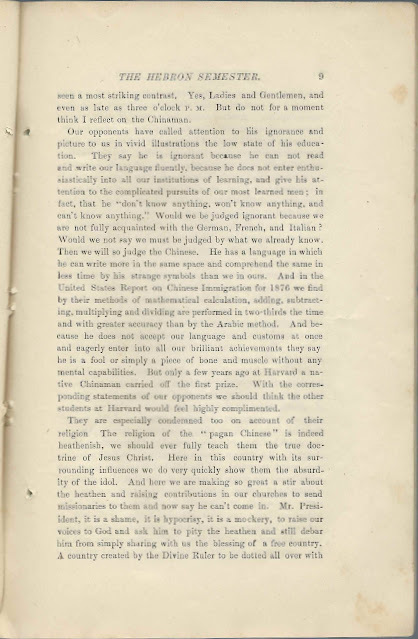 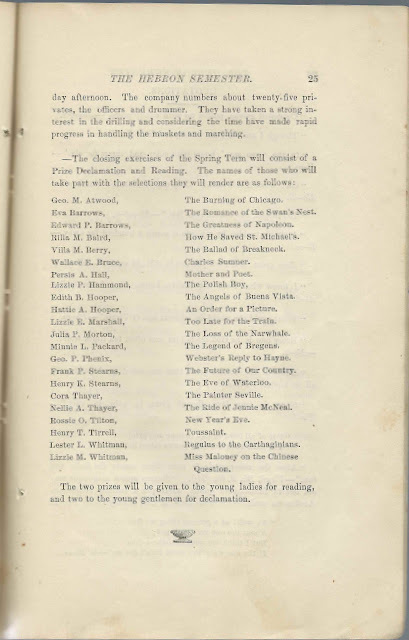 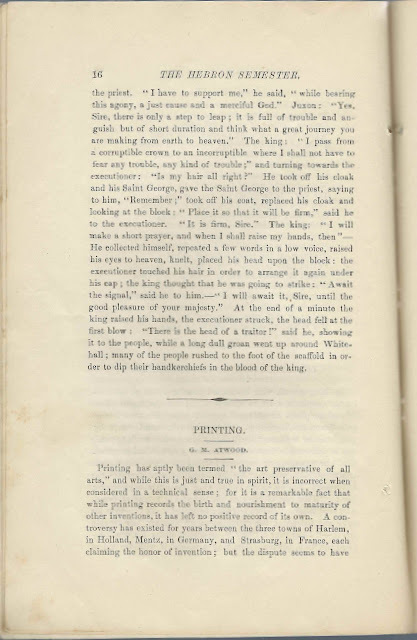 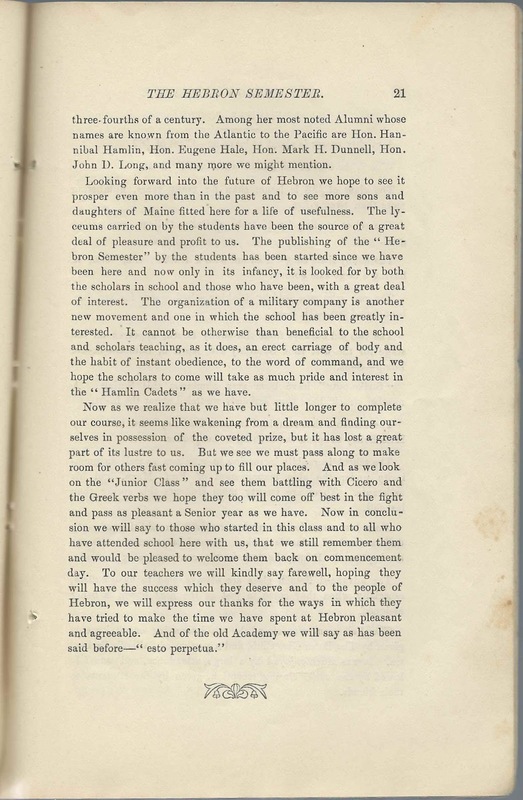 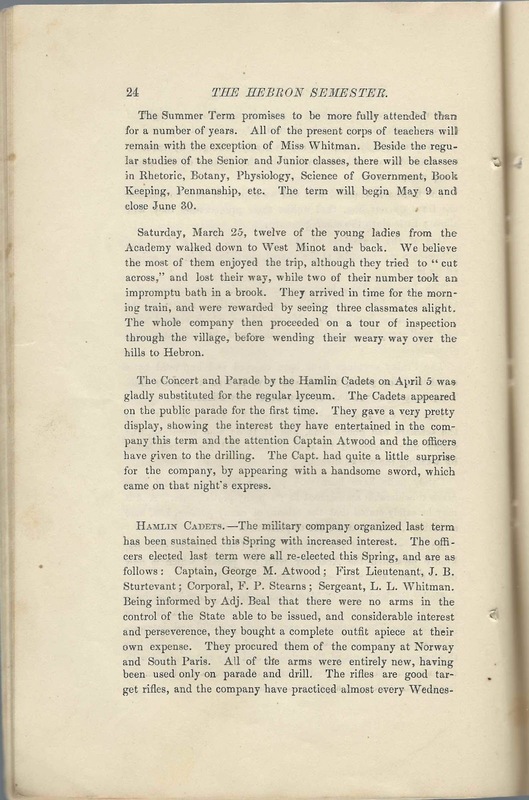 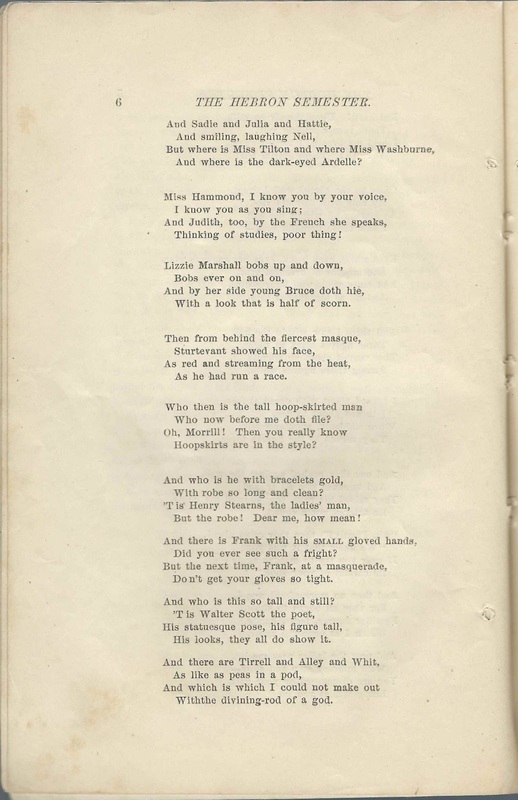 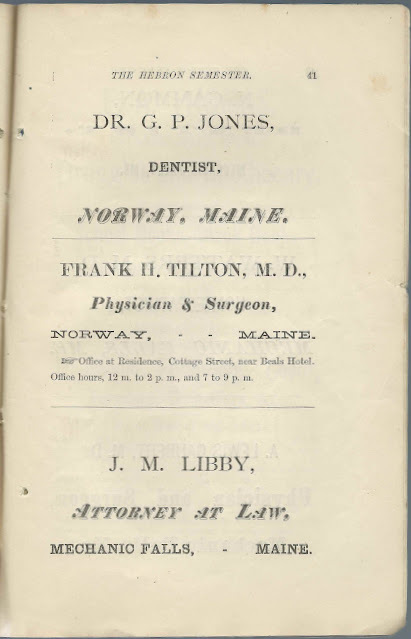 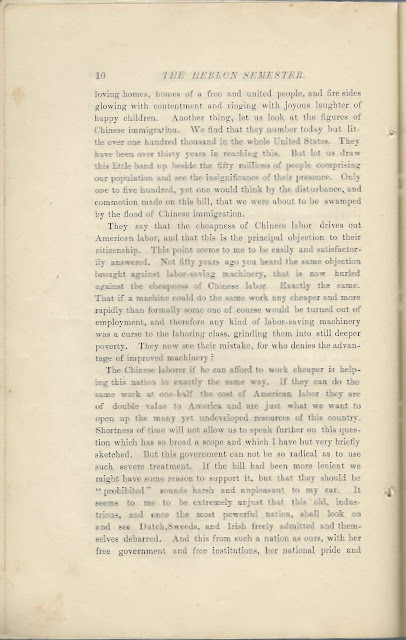 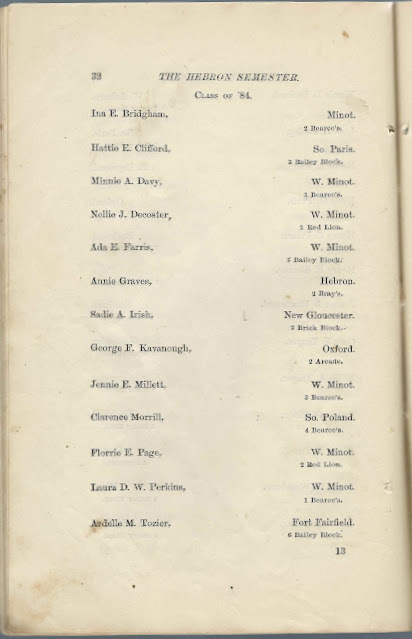 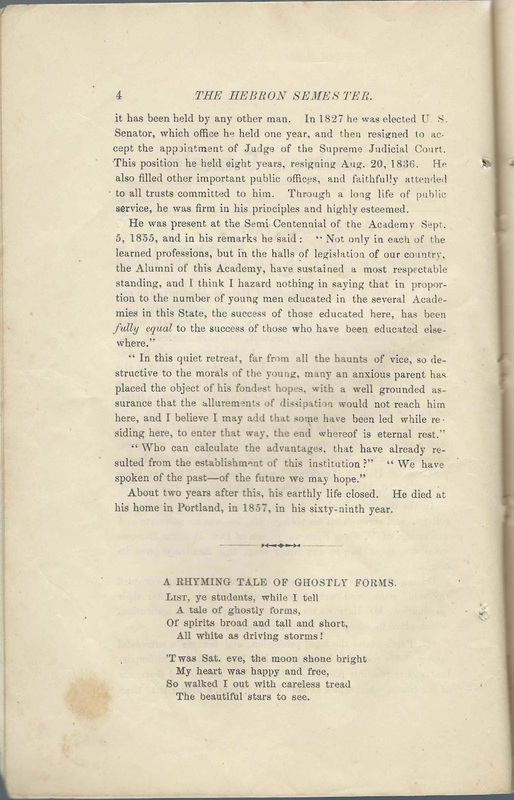 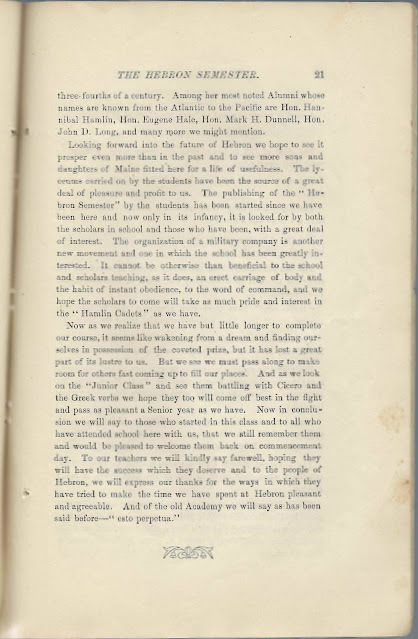 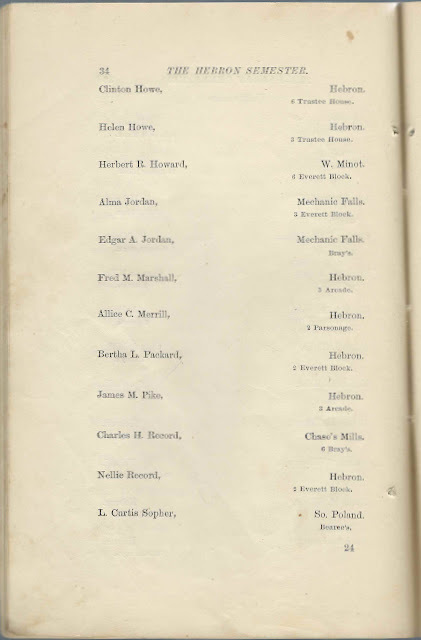 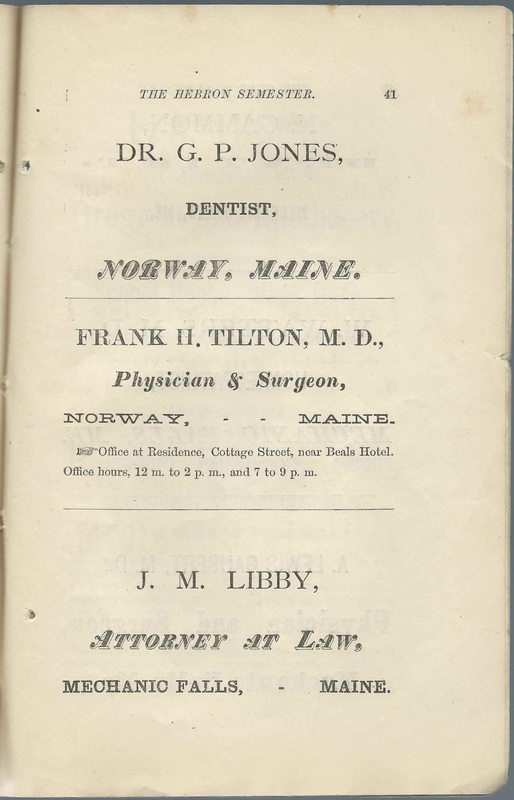 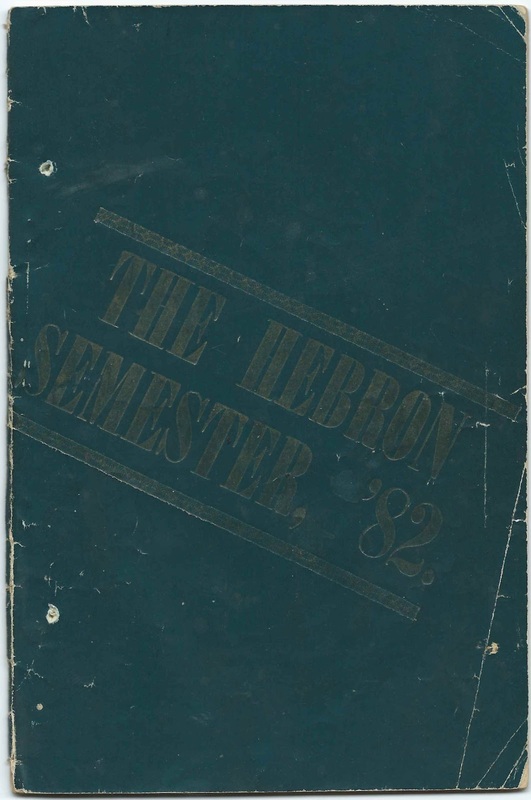 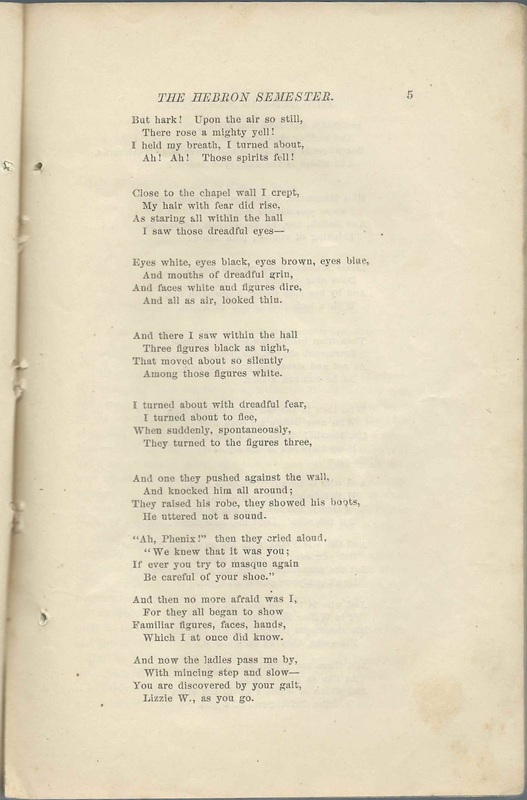 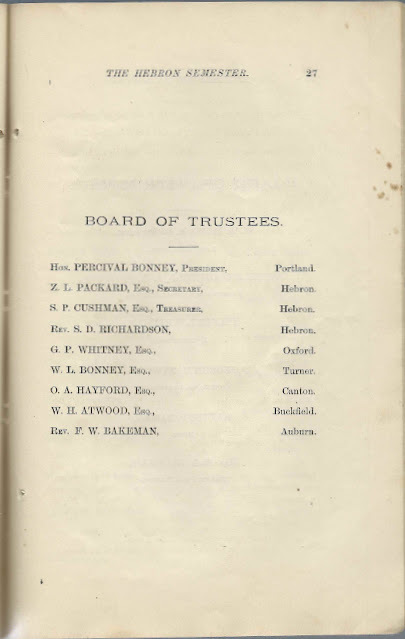 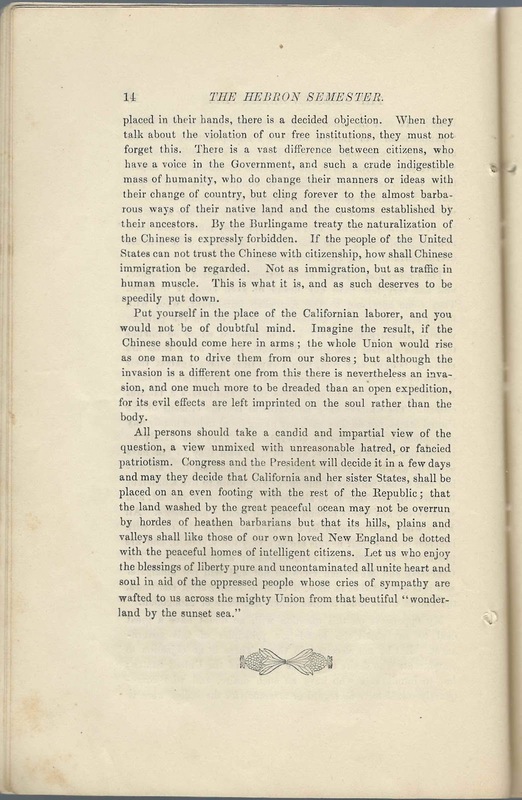 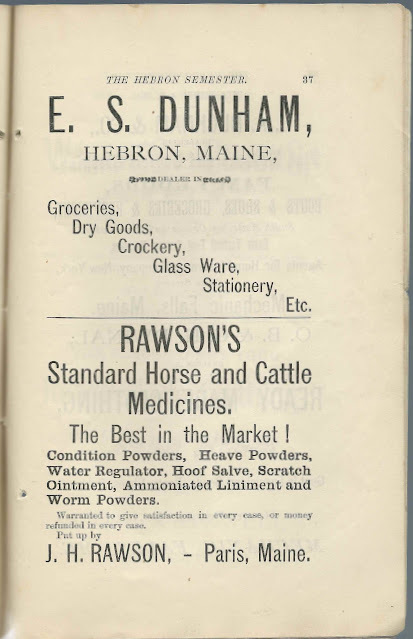 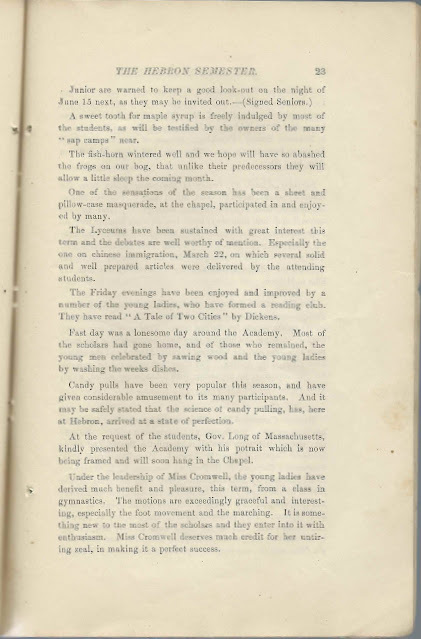 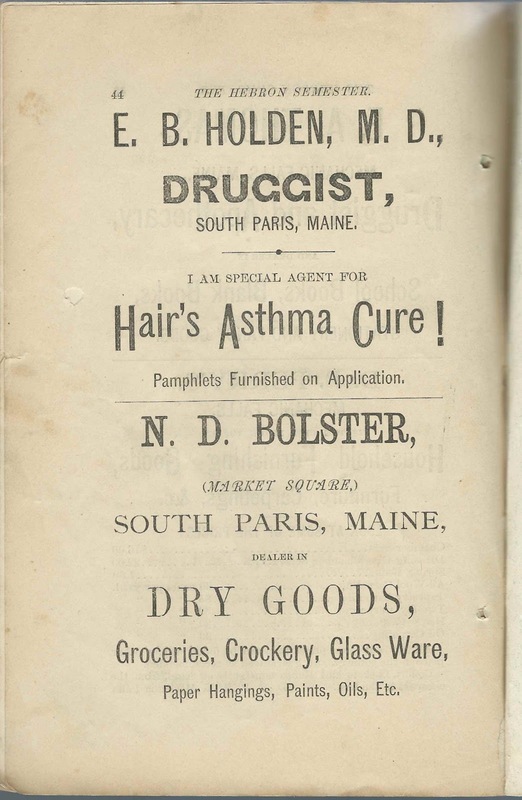 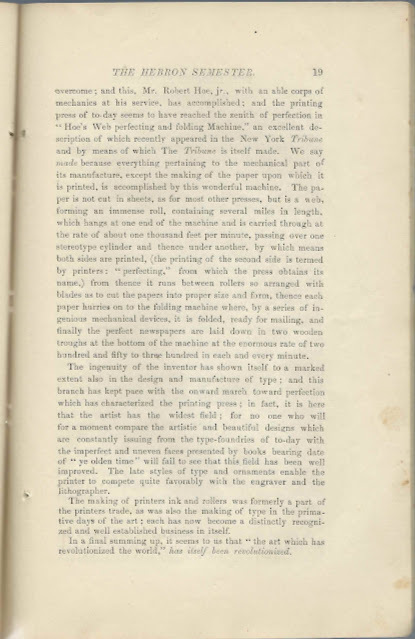 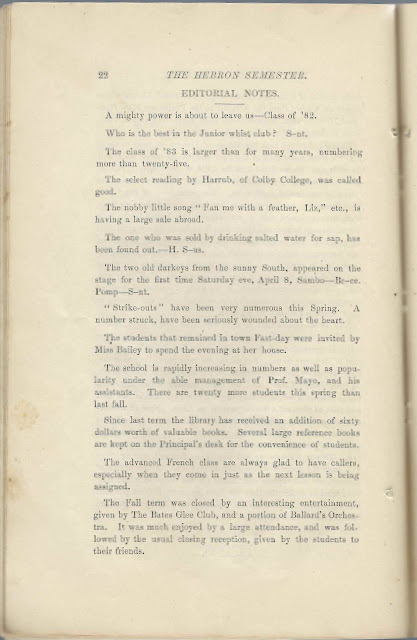 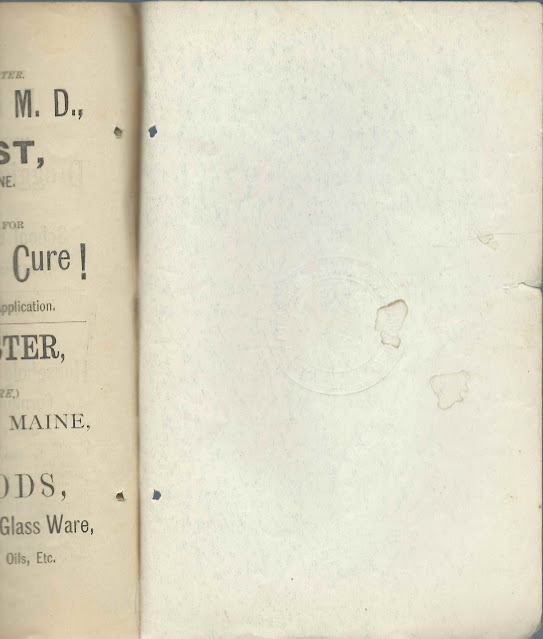 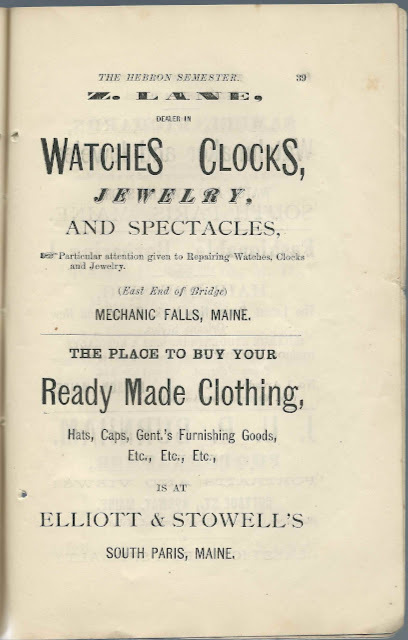 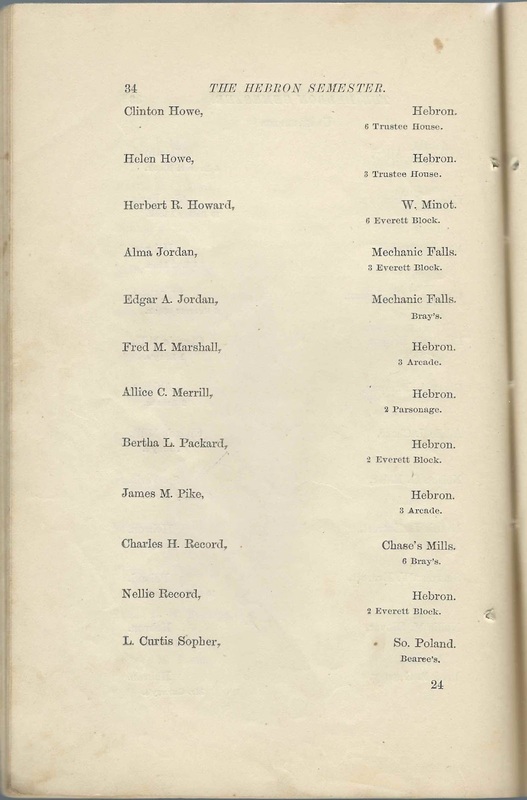 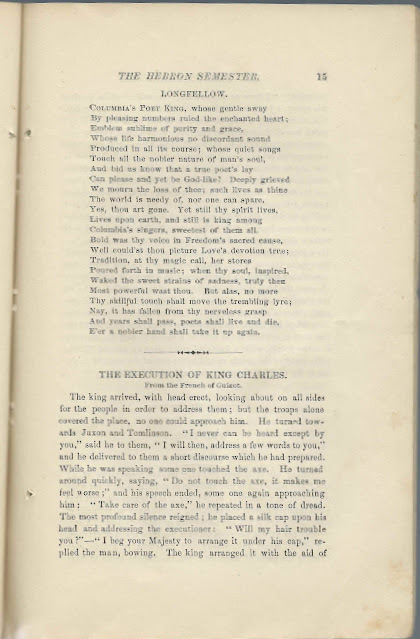 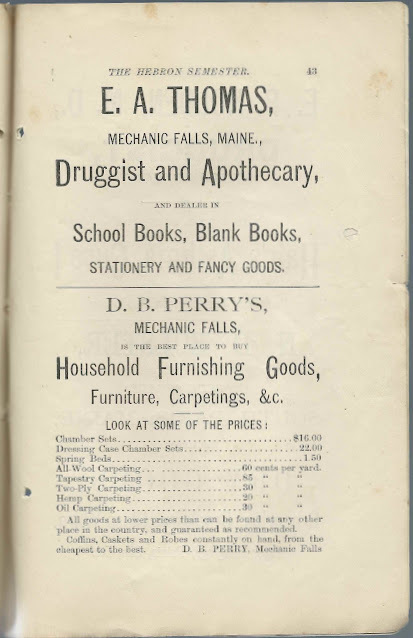 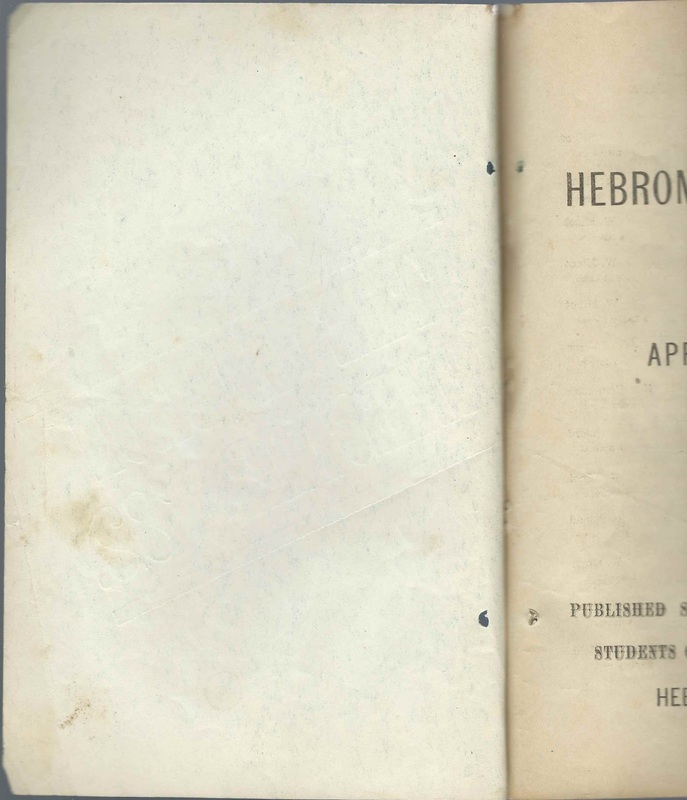 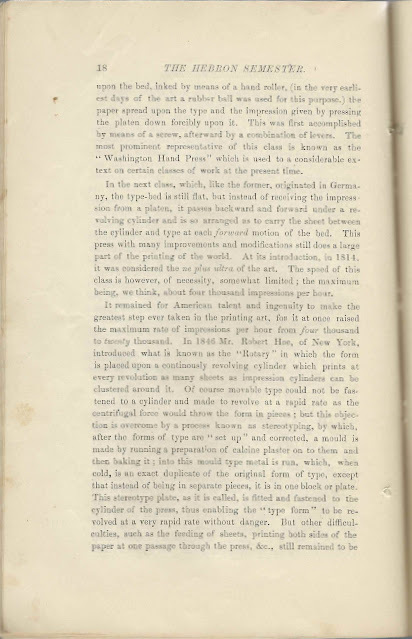 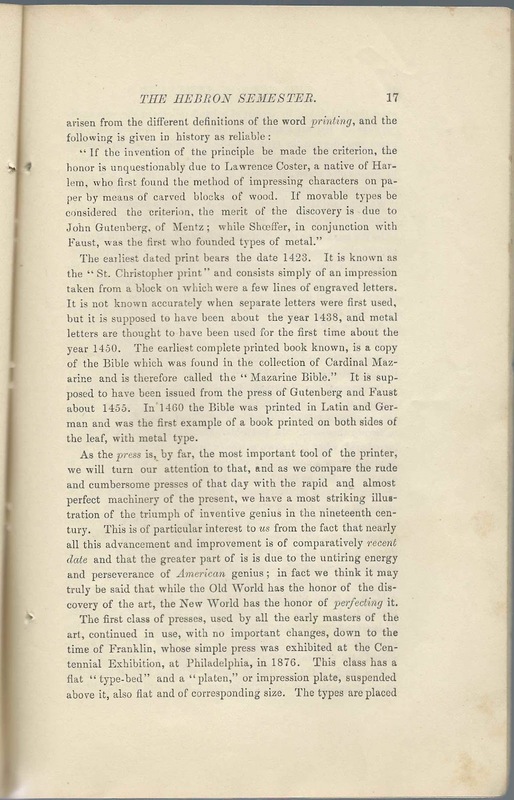 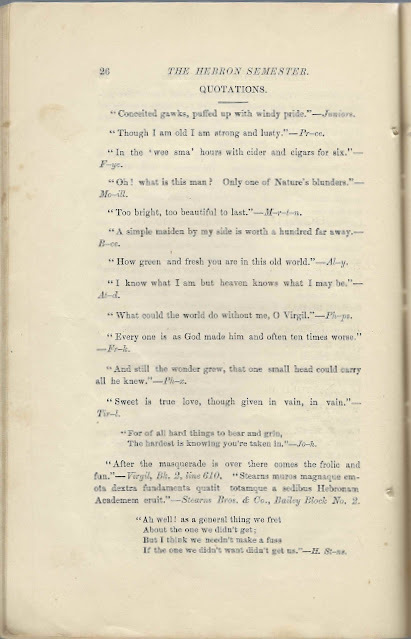 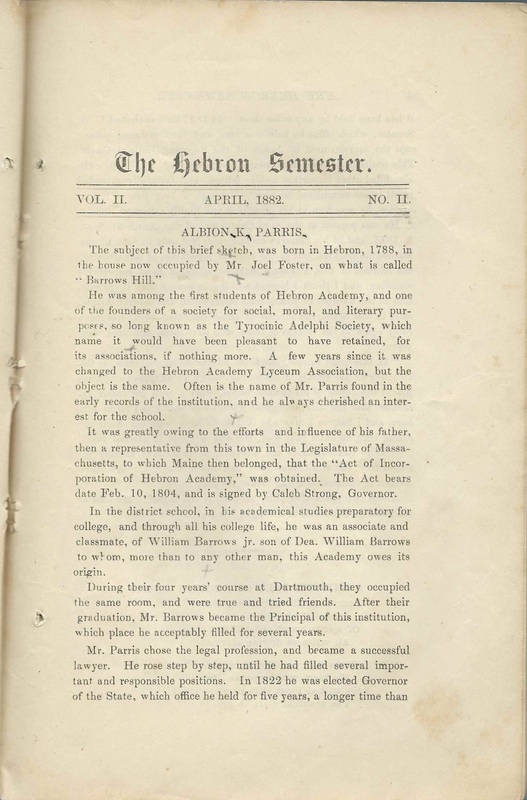 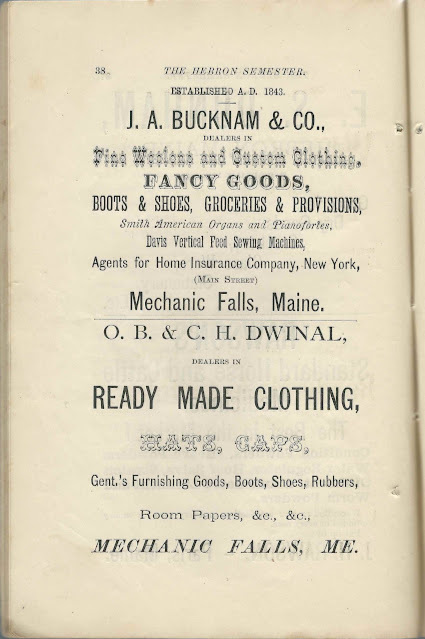 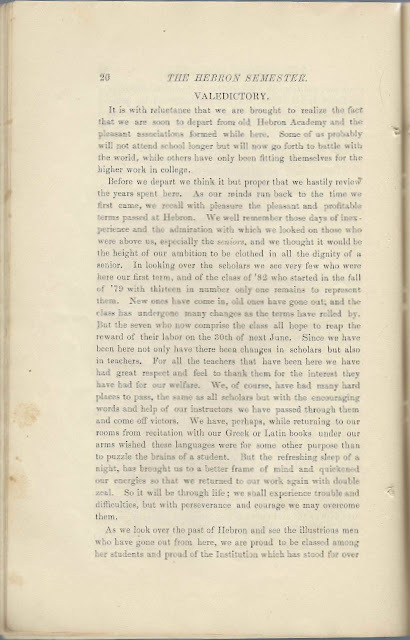 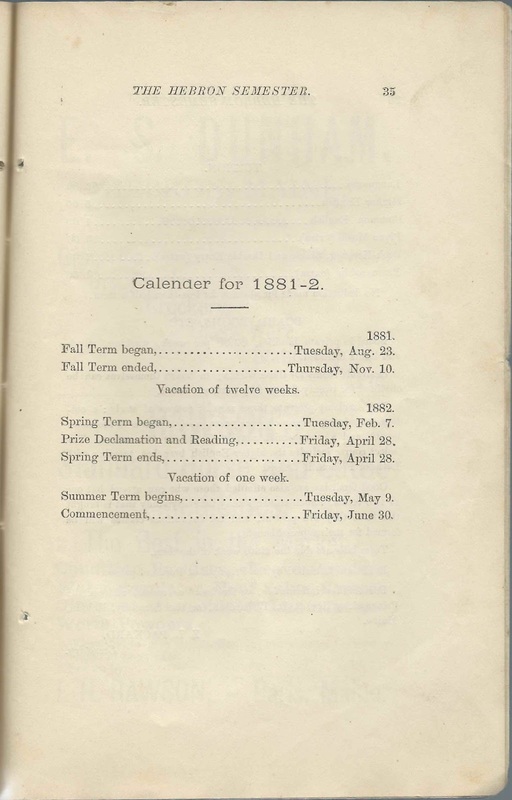 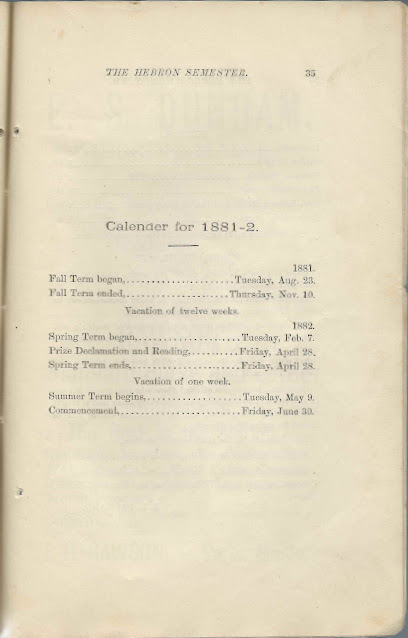 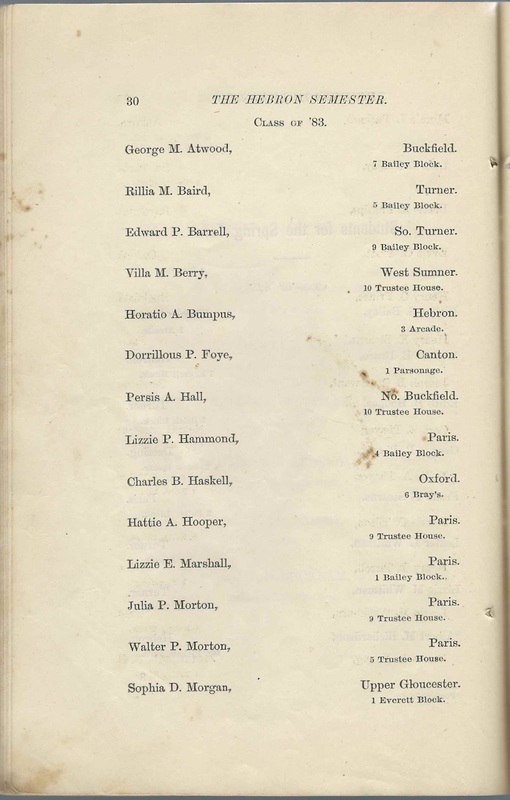 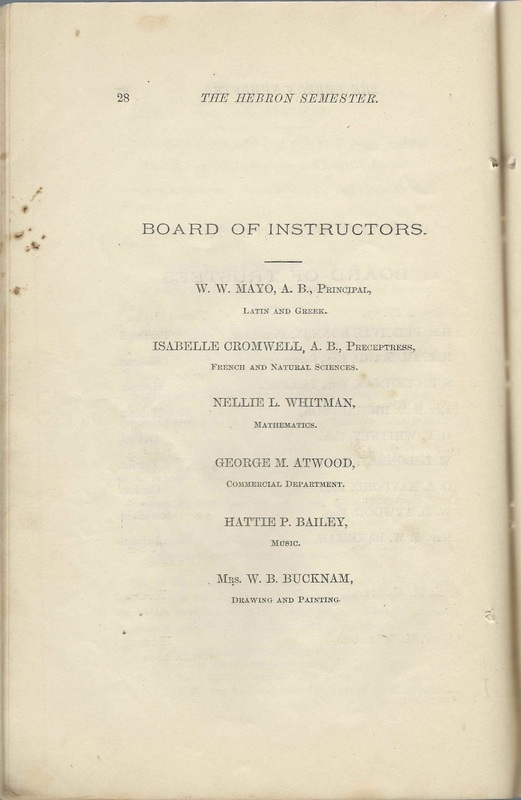 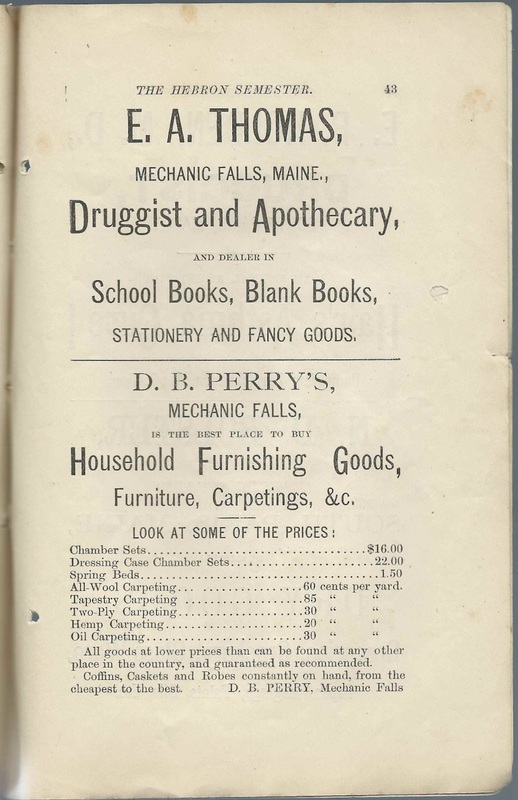 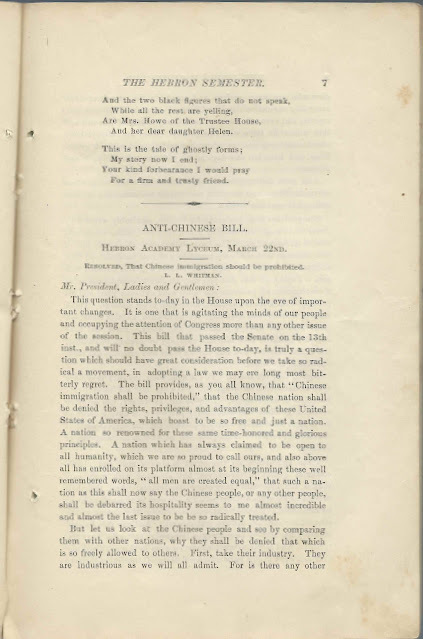 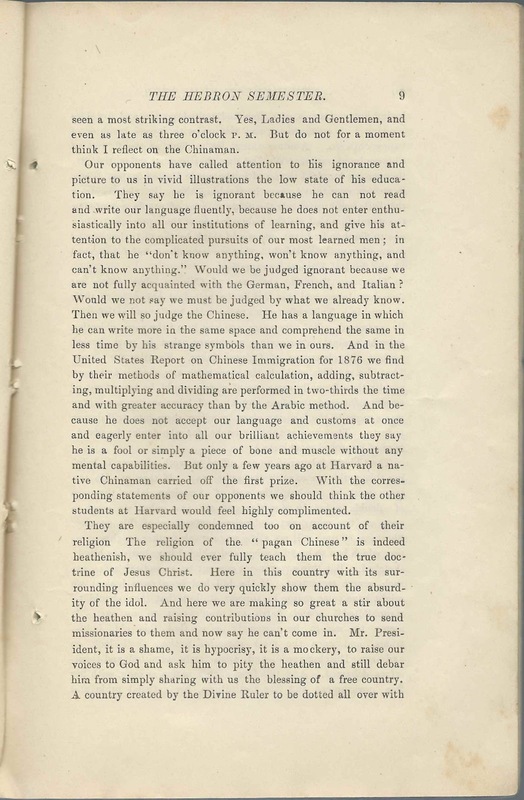 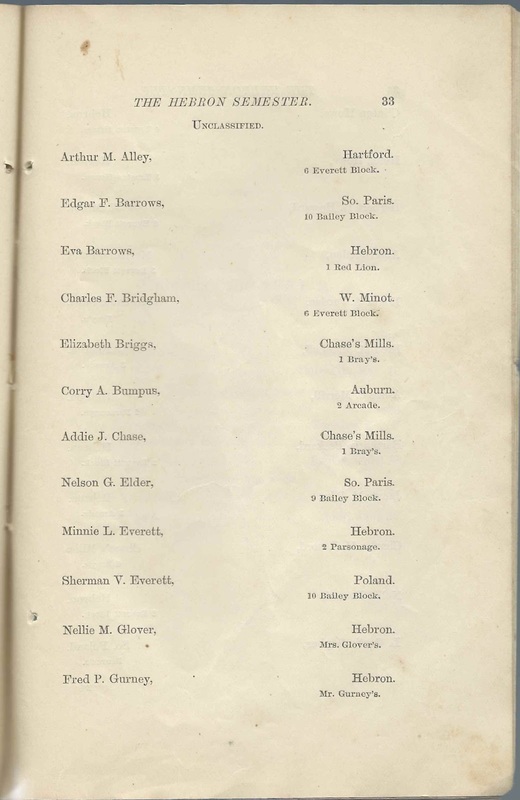 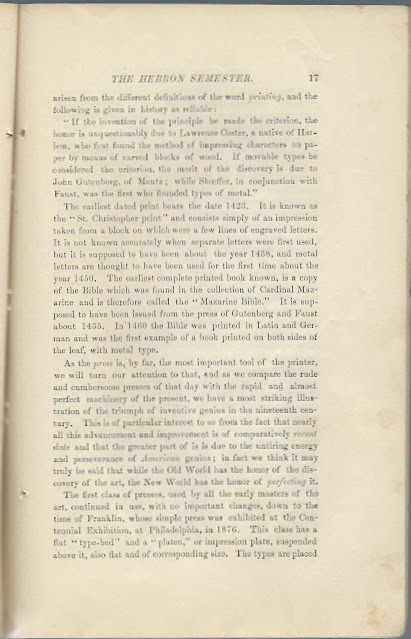 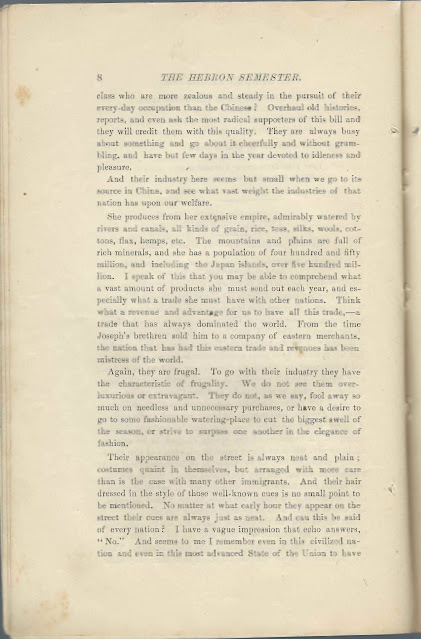 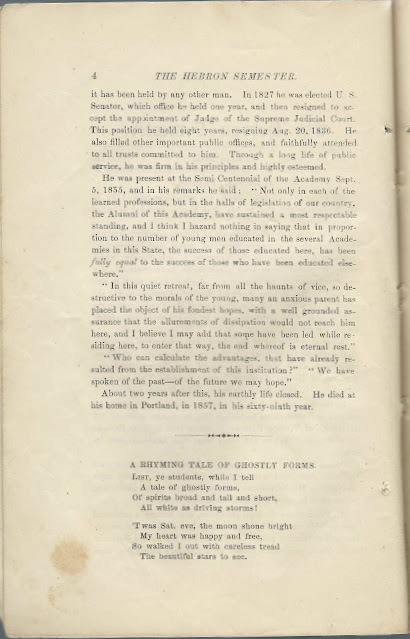 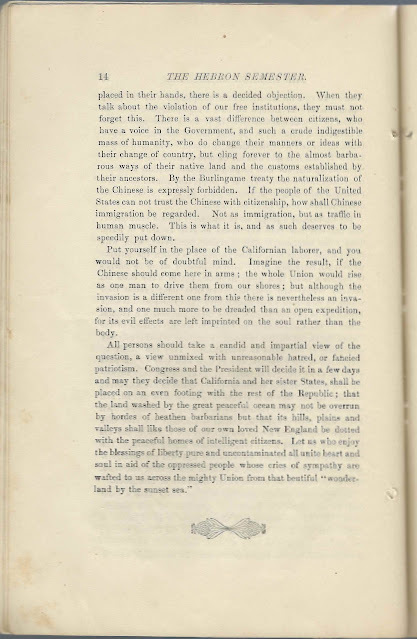 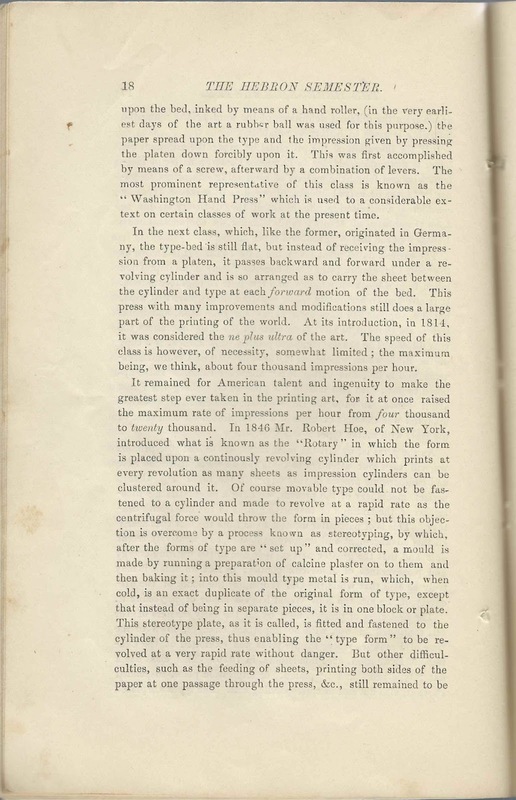 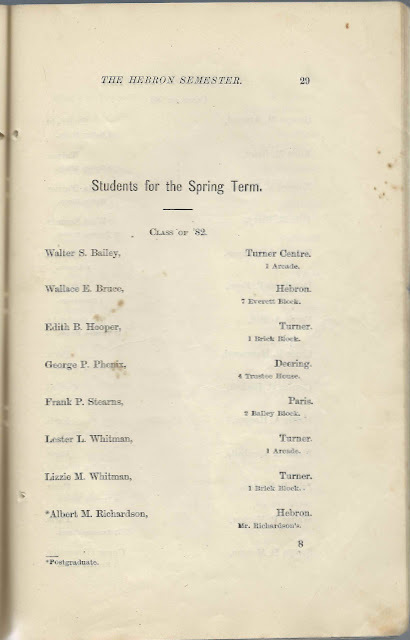 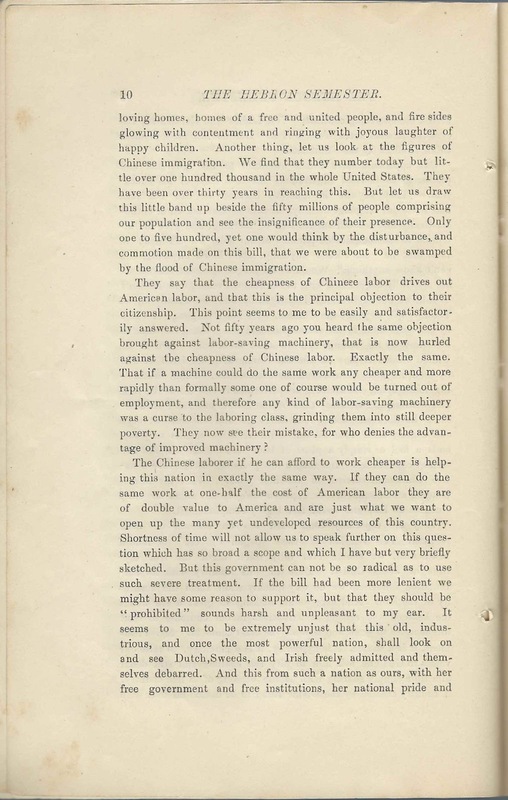 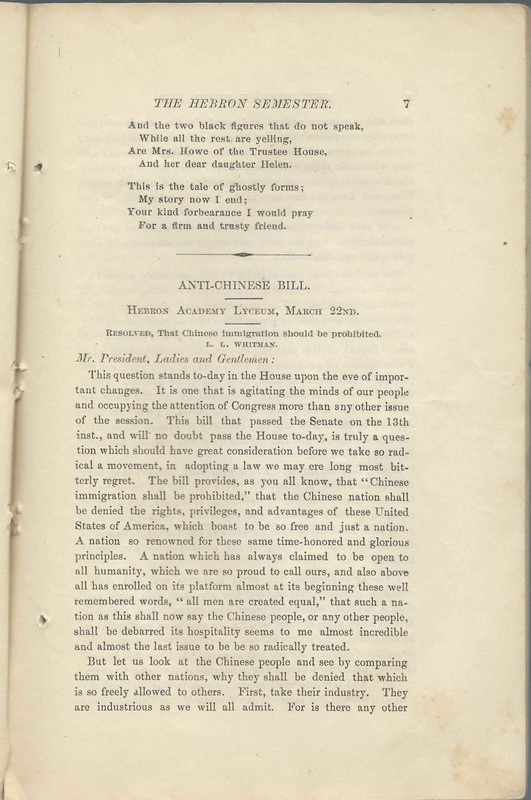 April 1882 issue of The Hebron Semester, a student publication of Hebron Academy at Hebron, Maine. 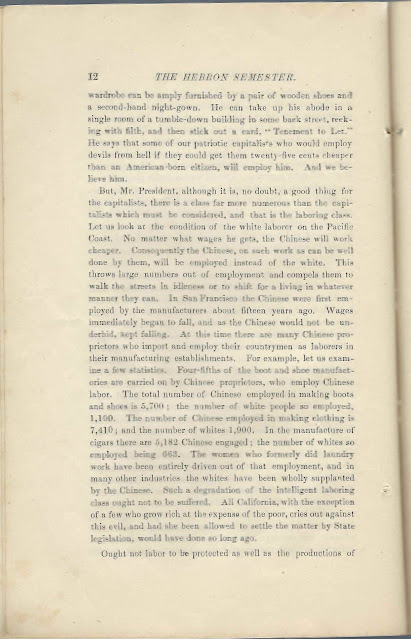 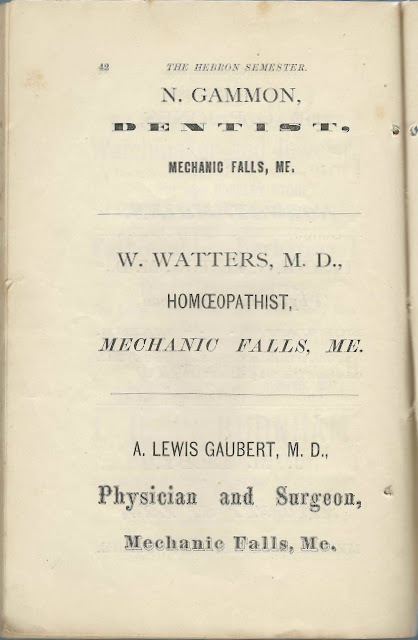 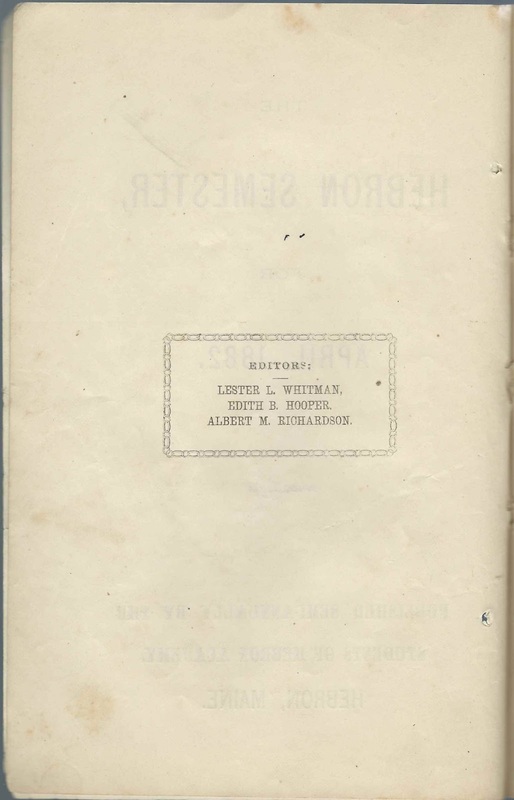 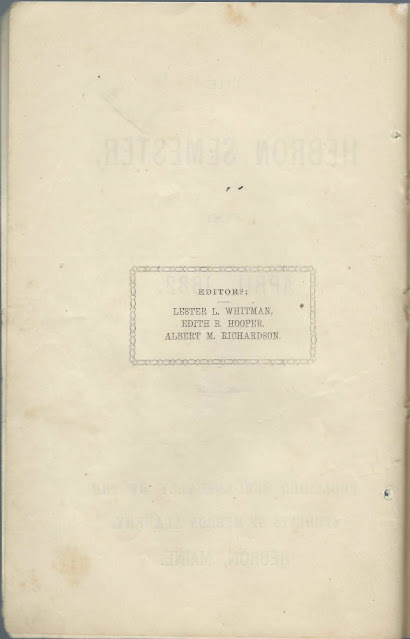 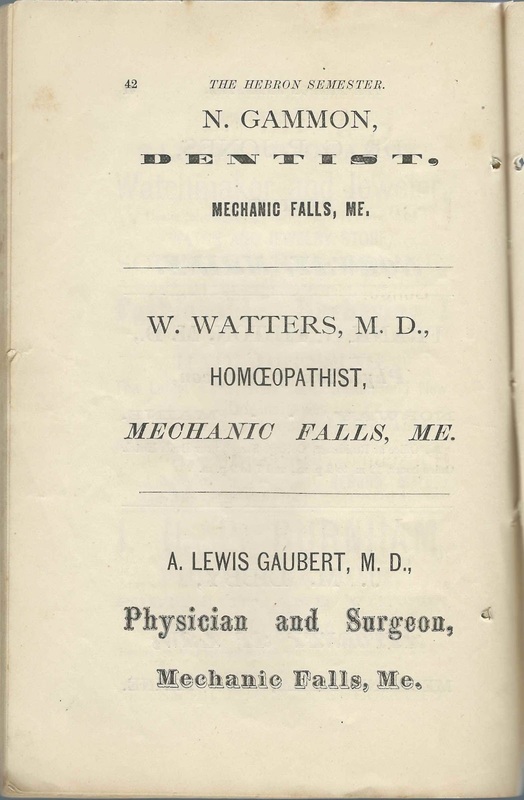 The editors were Lester L. Whitman, Edith B. Hooper and Albert M. Richardson. 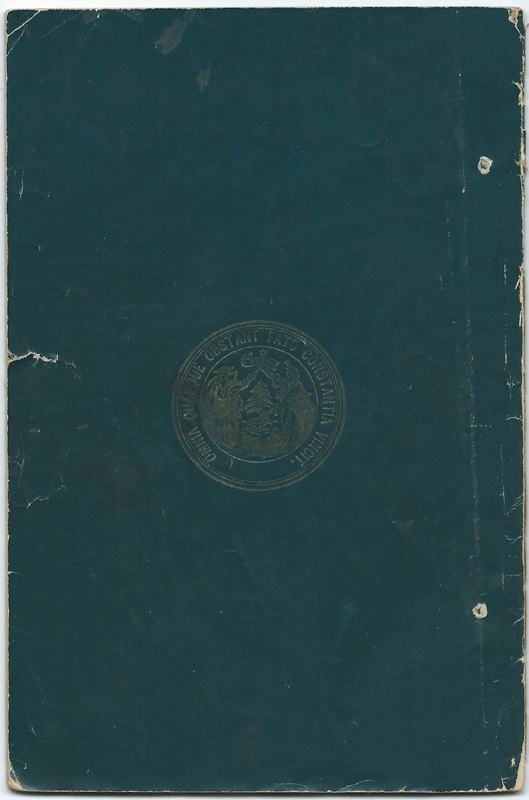 The issue measures a bit more than 8-1/2" by 5-1/2" and contains 44 pages. Images of all of the pages appear at the end of this post. 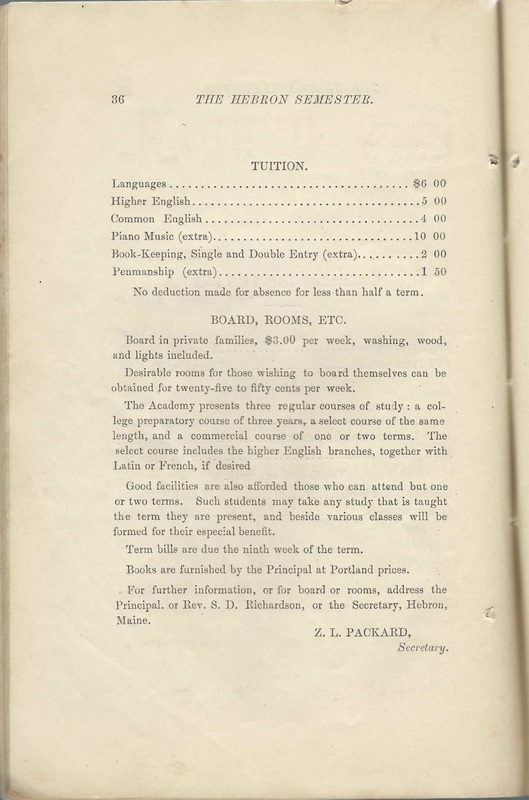 George M. Atwood, instructor in the Commercial Department, page 28; presumably not the student George M. Atwood, but perhaps a relative. 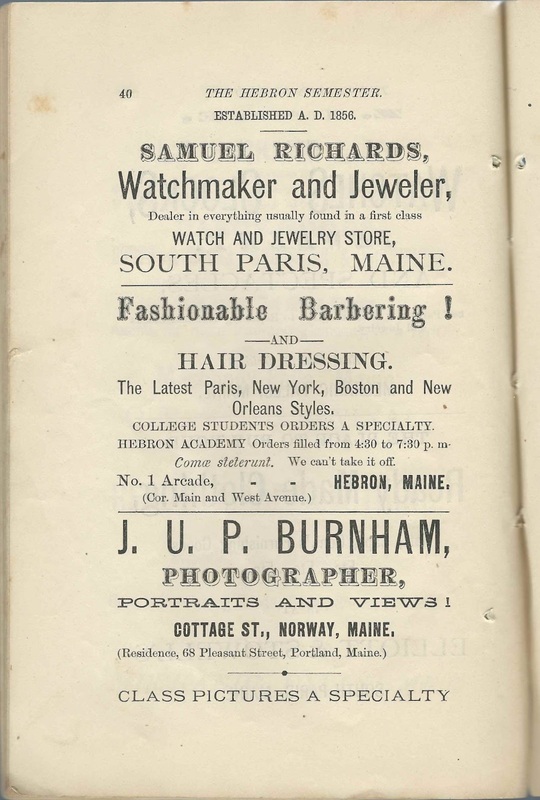 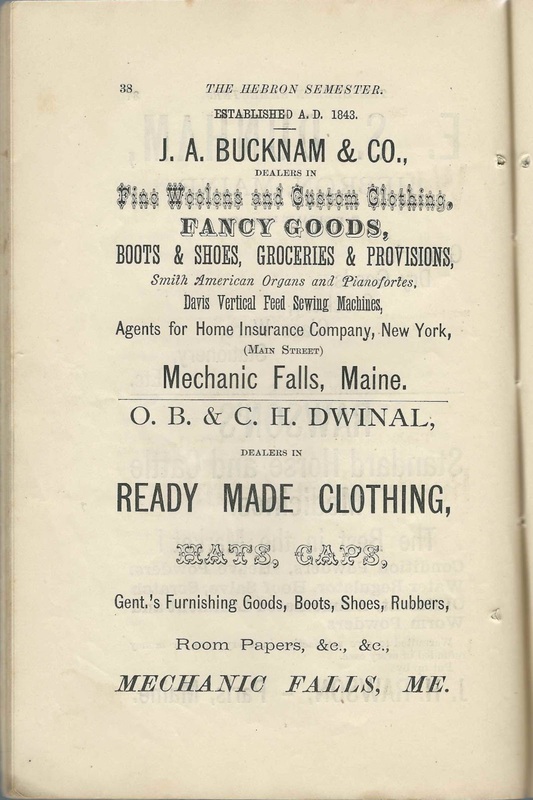 Rillia M. Baird of Turner, Maine; 5 Bailey Block, Class of 1883 Spring Term, page 30; reading "How He Saved St. Michael's", page 25. 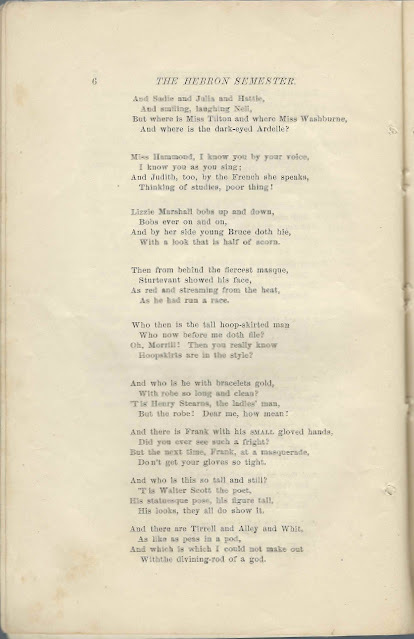 Her name was spelled as Rilla Bard in a previous issue. 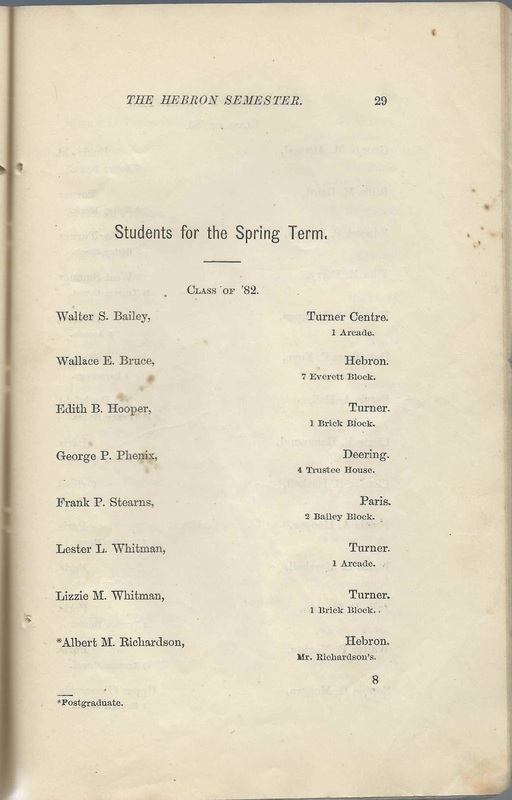 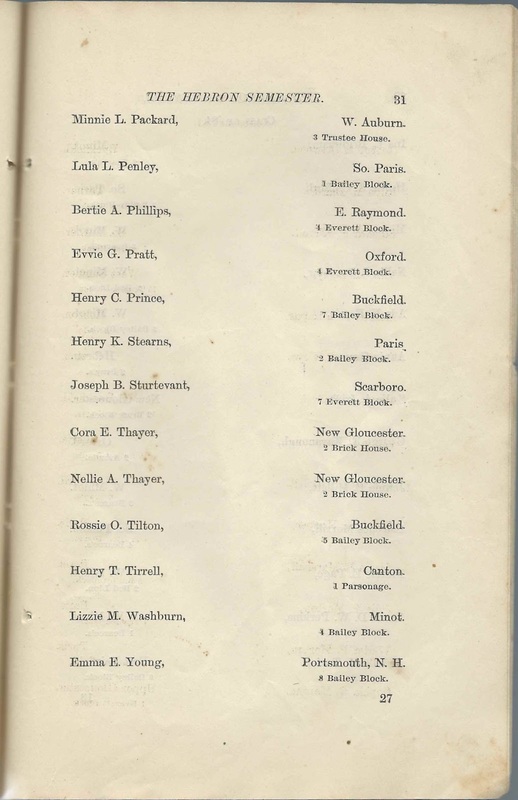 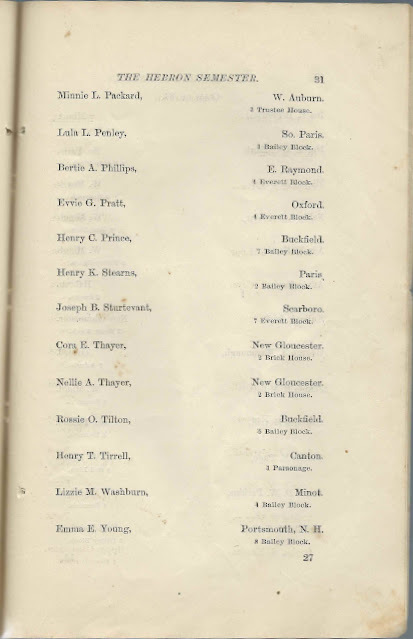 Edward P. Barrell of South Turner, Maine; 9 Bailey Block, Class of 1883 Spring Term, page 30. Could he be Edward P. Barrows? 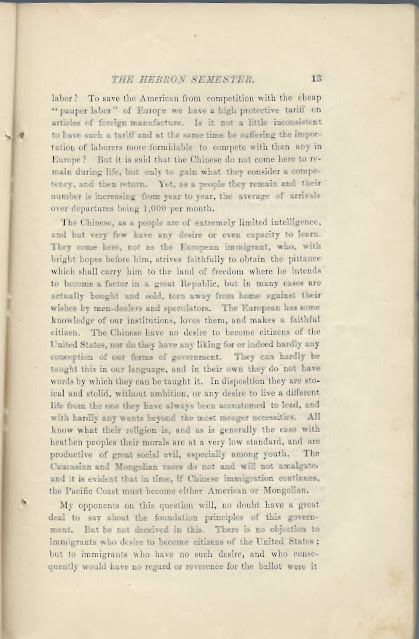 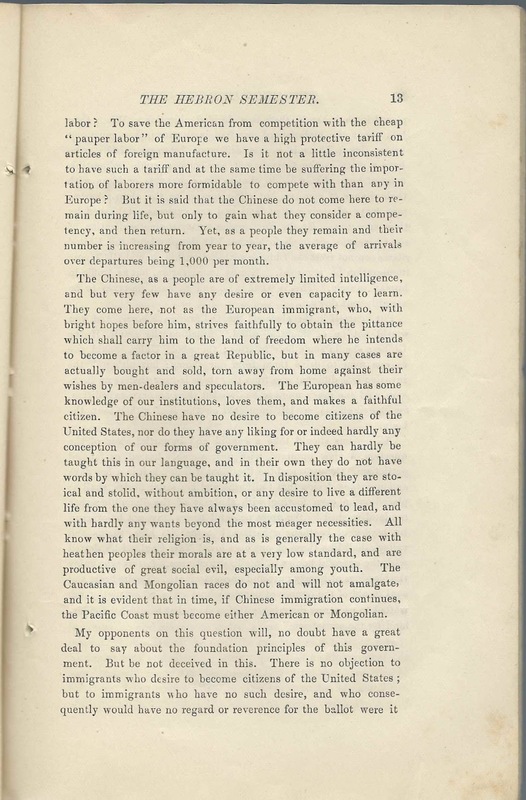 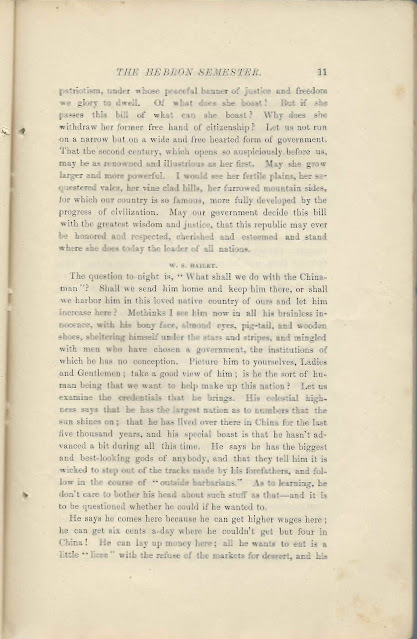 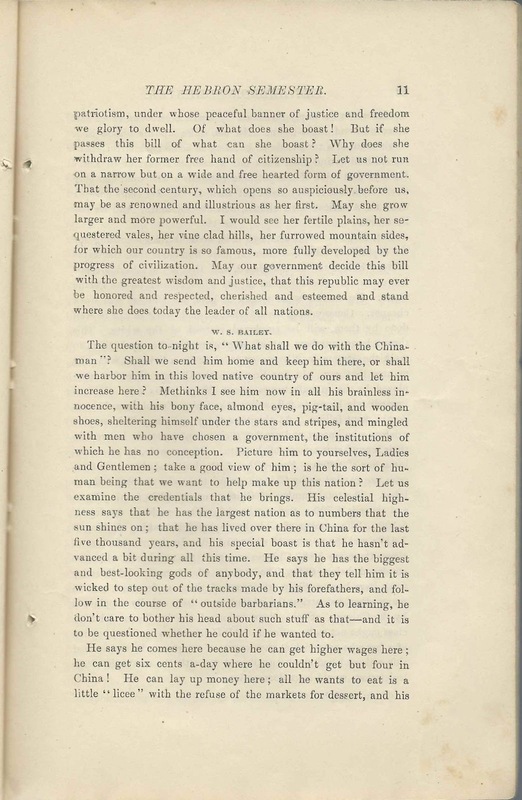 Edward P. Barrows, declamation "The Greatness of Napoleon", page 25. 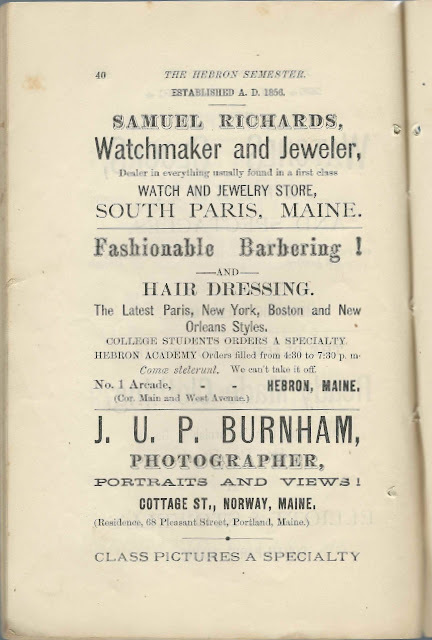 Could he be Edward P. Barrell?